Create flowcharts easily with this Windows software. Whether you're mapping out ideas, laying out the structure of your organization or creating UML diagrams, ClickCharts is the perfect user-friendly program to get you going. Simplify complex processes, troubleshoot bottlenecks and find areas for improvement. Organize your ideas visually and make even the most complicated process easier to understand. The intuitive user interface helps you choose from a variety of symbols, shapes and colors to uniquely convey your ideas. EDraw is a new organization chart drawing software, which creates organisation charts and business charts with minimum time loss for you. Support basic flowcharts, organizational charts, business charts, hr diagram and work flowchart. Perfect business and technical diagramming software with rich templates and examples. It is a vector-based graphic design software, quickly create illustrations, documents, manuals, schemas, plans, flow charts, org charts, network diagrams, UML etc. 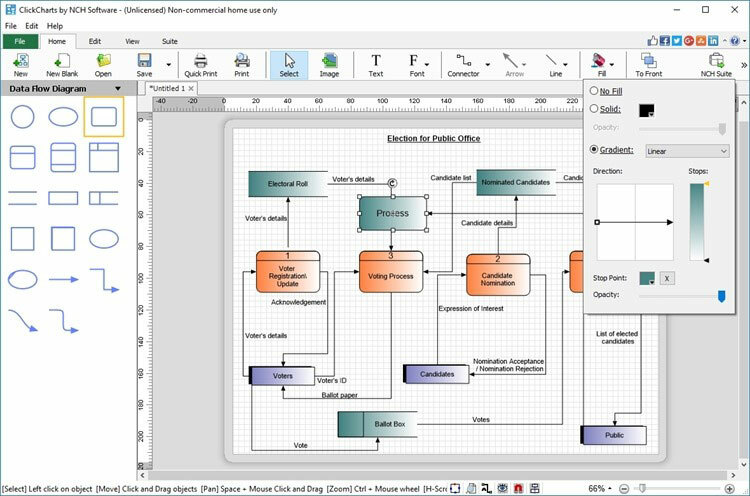 Easy to use Visio like tool that allows you to build visual maps. Includes user defined composite symbols and relationship, auto-routing, and an innovative 'bird's eye' view. Package includes online help, full uninstall and several examples. Schematic is a diagramming tool that allows complex diagrams to be drawn with ease. Schematic allows you to combine text, pictures, shapes and connectors to create clear and informative diagrams. Includes libraries for UML and Electrical diagrams.